Not many people make bread from scratch anymore. We live is such an instant society with a drive-thru restaurant on almost every corner, why wait? The other night my husband and I were invited over for dinner with a wonderful family and we had the privilege of eating homemade bread! It was amazing! It was probably some of the best bread I’ve ever eaten. So, I got to thinking about the whole kneading process that the dough has to go through to become the finished product – delicious, great-tasting bread. You literally have to press it and fold it, and press it and fold it over and over again. Usually it takes about 20 minutes of pressing and folding until the dough is ready. This process allows the dough to stretch and not collapse when it is put in the fire of the oven. 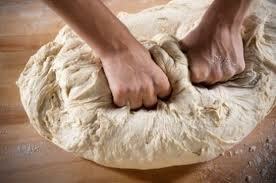 Kneading the dough is the most time-consuming part of the whole process. This is why not many people make homemade bread. This also applies to us spiritually. Some people get saved and never really grow or allow God to change them because they don’t want to go through the fire and allow the worthless things in them to burned off. If we want to be great and fulfill our God-Given potential in this life, we have to allow God to knead us, press us and fold us, over and over again. We have to be stretched if we ever want to grow or rise above our current condition. When we allow God to work this process out in us we can rise to be all He has called us to be! It’s pretty interesting to know that if you don’t knead the dough and get it ready, when you put it in the oven- in the fire, it will not rise! The dough will collapse under the pressure. It is easy to become comfortable and resist stretching. A lot of us resist change, we resist the prompting of the Lord to deal with areas in our life that need to be pressed, folded and stretched out so we can rise to the top! Have you ever collapsed under trials? 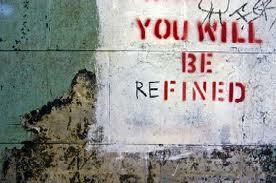 We have to allow God to refine us in the fire. I want to encourage you today to allow God to stretch you. If you ever want to become all God has you to be you have to be willing to go through the process. When you are stretched… you won’t give up and collapse in the fire. You will rise! You will pass the test and you will be like gold.